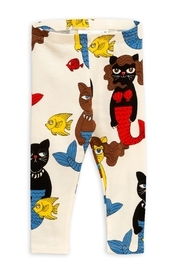 Off white, printed leggings styled from a light and airy Tencel® fabric. 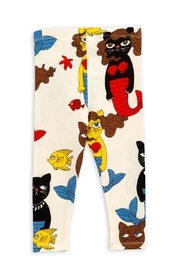 Featuring an allover print with cat mermaids and tropical fish and a comfortable elasticated waistband. The leggings are made of Tencel® which is manufactured in a unique closed loop system where the chemicals are recycled instead of being leaked out into nature, the fabric is a durable, soft and cool to the touch.